What happens if we do nothing about greenhouse gas emissions and end up in a worst case climate change scenario a century from now? 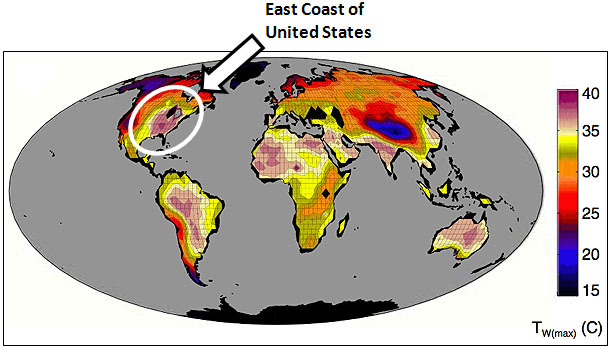 A new paper in the Proceedings of the National Academy of Sciences takes a look at the likely effects of very high global warming and concludes that large swathes of the world — including the East Coast of the United States — would become pretty much uninhabitable. In the map below, that’s all the yellow and light purple areas. Stuart Staniford has the details. But don’t worry. It’s only 5% likely that things will ever get this bad. Or the scientists might have miscalculated. It might only be 1% likely. Those are pretty good odds, right?